ULRICH HABHEGGER. 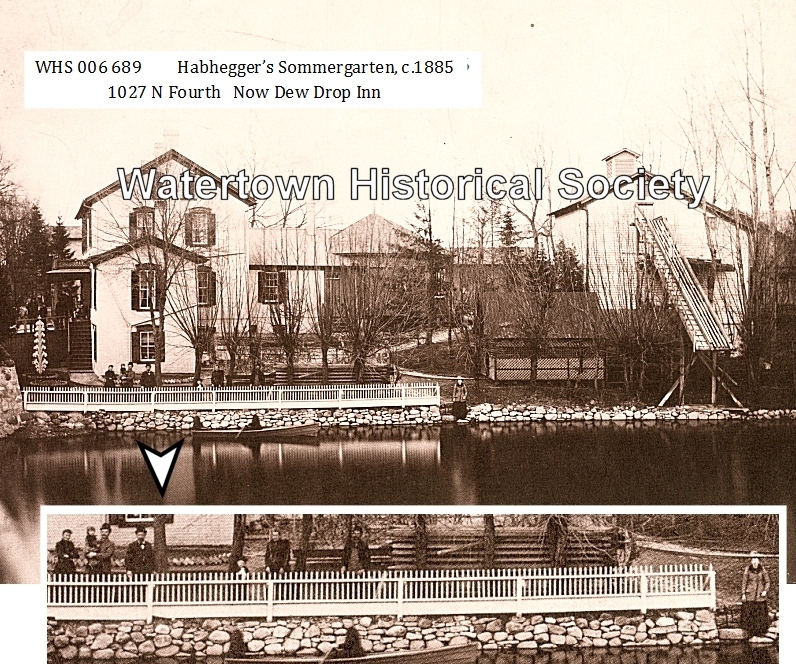 To supply the community in which he resided with the necessaries of life was the business to which Mr. HABHEGGER devoted his time and attention, and it is no more than justice to say that he made it a point to keep an extensive and pure line of goods and to sell them at prices within the reach of all. His emporium was popular and well patronized for obvious reasons, and to his credit be it said that his patronage was constantly on the increase. 1853 He is a product of Canton Bern, Switzerland, the eldest of eleven children born to the marriage of John Habhegger and Barbara Luethy, with whom he came to the United States of America in boyhood and with them settled in the town of Watertown, Jefferson County, Wis., in 1853. 1856-1893 He continued to remain with his parents until 1856, when he decided to make a start in life for himself, and for this purpose went to Iowa and bought a farm in Polk Count, that State, which he tilled with reasonable success for five years. He then returned to the Badger State and turned his attention to the grocery and commission business, as a more congenial (to him) and profitable employment and was successfully engaged in this occupation until 1893, with the exception of two years, which were spent in farming in Emmet Township, Dodge County, Wis.
1857 On the 31st of January, 1857, he was united in marriage with Miss Lina GFELLER, and their union has resulted in the birth of six children, four daughters and two sons: Sophia, Eliza, Lina, Lillie, Emil, and Albert. 1893 In 1893 the infirmities of increasing years, and the fact that he had accumulated a comfortable competency, cause him to retire from the active duties of life, and he took up his residence in the city of Watertown where he had so successfully conducted his mercantile operations. 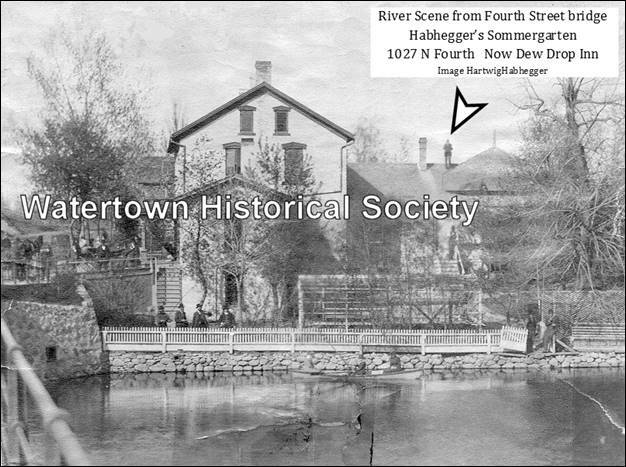 Mr. Habhegger and his family are members of the German Protestant Church, and socially he is a member of the I.O.O.F. at Watertown. He is of the material of which useful and honorable citizens are made, and it is to such men as he that Uncle Sam extends a cordial welcome to this country. The prosperity of the section in which he has made his home for so long has always been of great interest to him and he has done all in his power to aid improvements and enterprises that had for their object the good of the county, and has been elected to various honorable official positions, such as alderman, supervisor and school commissioner, positions which he filled several terms each. He is president of the Watertown Shoe Company. From Memorial and Genealogical Record of Dodge and Jefferson Counties, Wisconsin, publ. 1894, pgs 44-45. 07 02 Saturday evening Albert Habhegger held a lighted match over the open bung of a whisky barrel in the cellar of his father's store, at Hustisford Street bridge, to see how much liquor was contained in the package. The gas arising from the liquor took fire, forming quite a blaze and causing the barrel to be twisted around with considerable momentum. In close proximity were kerosene, wool and other combustibles, rather ominous surroundings under the circumstances. 09 21 At the Democratic convention held September 21, 1894, he was nominated for county treasurer of Jefferson County, and was elected to that office November 6, 1894, by a large majority, a fact which spoke eloquently as to the popularity and esteem in which he was held. He was a faithful and capable official and won universal respect as an officeholder. 05 16 It is The Gazette's sad mission this week to publish the death of Ulrich Habhegger, one of Watertown's best-known and most esteemed residents. Mr. Habhegger was taken ill shortly before the holidays last winter with paralysis and since then he gradually failed until death claimed him last Sunday night, May 12, 1912. 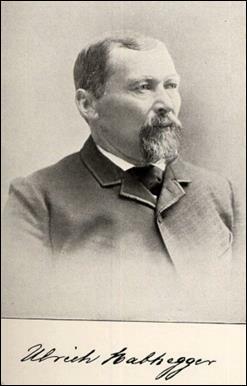 Mr. Habhegger was born in the Canton of Bern, Switzerland, March 12, 1834, and with his parents came to America in 1853, settling first in Milwaukee and then in the town of Watertown. In 1856 he removed to Iowa and bought a farm in Polk county in that state, which he tilled for five years and then returned to this state and engaged in the mercantile business, which he continued till 1867, and he once more engaged in farming until 1869, when he again engaged in the mercantile business, in which he continued till 1893, since which time he led rather a retired life, but was interested as a stockholder in various Watertown enterprises, at our time being one of the principal stockholders in the Watertown shoe factory. He has held many public offices, including alderman, supervisor, school commissioner, and held the office of city[?] treasurer of Dodge County two years, and was for many years trustee of the county insane asylum and poor house, in all of which offices his administration passed an honor to himself and to the people he so faithfully served. January 31, 1857, he was united in marriage to Miss Lina Gbeller, the result of the union being six children, four daughters and two sons; four of whom[?] and his wife survive him, his children being Emil of Oshkosh, Mrs. Herman Krueger and Mrs. Ferdinand Hartwig of this city, Mrs. Louis Schmeidermann of San Diego, California, Mrs. Samuel Boss, Oshkosh. Mr. Habhegger's death is universally regretted here, for all classes of citizens held him in the very highest esteem. He was a man who always had a kind word for everyone, and strictly honest in all his dealings, socially as well as in a business way, and now that he has passed away, people in all walks of life mourn his death as one of the best of men. An old landmark operated as a saloon and grocery store for many years by Ulrich Habhegger was lost to the ravages of fire in November. Subsequent owners/operators were F. C. Hartwig, Herman F. Dreibus, George Loeffler and John Huss. The location served as a signpost for many traveling out of or into the city from the north. At the time of the fire the place was known at the Willow Inn. The establishment was popular with German-speaking residents of the community and with farmers who stopped there to exchange produce and sell and buy the commodities of the time. 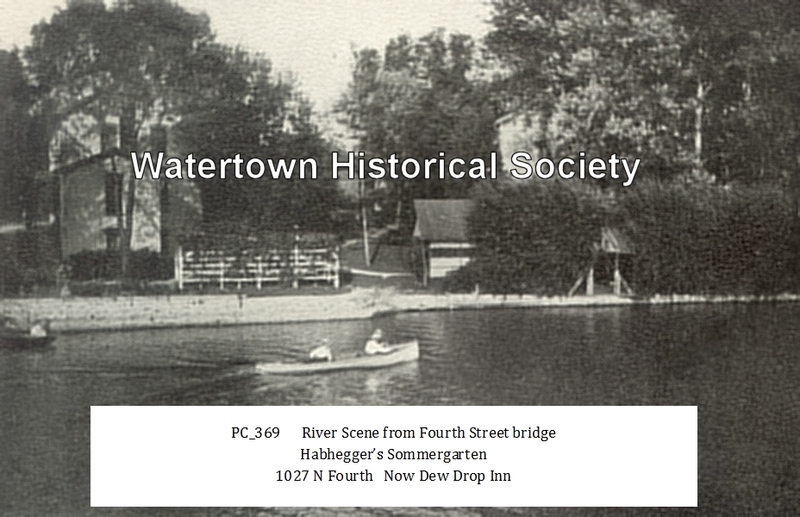 04 12 Dew Drop Inn will not be adding an outdoor patio area, the Watertown Plan Commission decided unanimously Monday, pleasing neighbors who worried about excessive noise emanating from drinkers on the proposed deck. Tavern owner Rad Buzdum wanted permission to construct a deck behind his bar at 1027 N. Fourth St., which is located in the middle of a residential neighborhood. Although Buzdum promised there would be no outdoor music, several neighbors turned out to Monday’s public hearing to oppose the idea. They said bar patrons already make enough noise without having a reason to stay outside for an extended period of time.